Earley Law Offices offers a multitude of client-centered services including LegalVault™, a special document storage system by Amicus Creative which allows you and your attorney to easily and securely store and maintain important documents as well as vital health and asset information for secure and convenient retrieval. Regardless of where you are, LegalVault™ allows you to have your healthcare documents and medical information at your fingertips. In the event that you require immediate medical care, especially when being treated at an unfamiliar hospital, you or your loved ones can simply present the attending physician with your LegalVault wallet card. 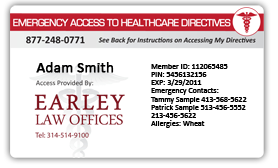 This card lists allergies, medications, emergency contact information and instructions on how to obtain all healthcare related documents such as a living will, healthcare power of attorney and organ donation forms. Hospital personnel will have access to your LegalVault info, allowing them to view only your healthcare-related documents. By providing caregivers access to your vital medical information, you can help prevent hospital errors which occur all too often when treating new patients. In addition to storing medical information, LegalVault™ gives you the option to store your most important documents for easy and secure retrieval anywhere at any time. With access to a computer you can securely view all of your stored documents in one convenient location.